Outlander is an American 60 minute scripted science-fiction television series, which kicked off on August 9, 2014, on Starz and is broadcast every Sunday at 20:00. The show is currently in its 4th season. Starz has officially confirmed the renewal of Outlander for Season 5. The exact release date is yet to be announced so far. Sign up to track it down. Outlander follows the story of Claire Randall, a married combat nurse from 1945 who is mysteriously swept back in time to 1743, where she is immediately thrown into an unknown world where her life is threatened. When she is forced to marry Jamie, a chivalrous and romantic young Scottish warrior, a passionate affair is ignited that tears Claire's heart between two vastly different men in two irreconcilable lives. The Outlander series, adapted from Diana Gabaldon's international best-selling books, spans the genres of romance, science fiction, history and adventure into one epic tale. Season Four of "Outlander" continues the story of time-traveling 20th century doctor Claire Fraser and her 18th century Highlander husband Jamie Fraser, as they try to make a home for themselves in colonial America. As Claire and Jamie build their lives together in the rough and dangerous back country of North Carolina, they must negotiate a tenuous loyalty to the current British ruling class, despite Claire's knowledge of the American Revolution to come. Along the way, the Frasers cross paths with notorious pirate and smuggler Stephen Bonnet in a fateful meeting that will come back to haunt the Fraser family. 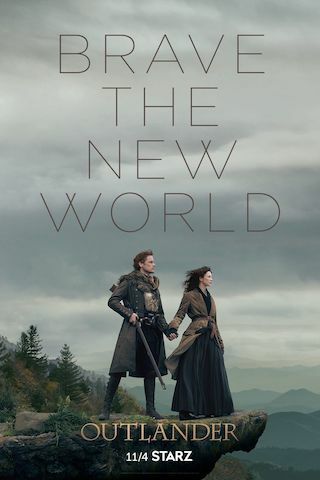 Meanwhile in the 20th century, things are complicated between Brianna Randall, Claire and Jamie's daughter, and Roger Wakefield, the historian who helped Claire search for Jamie in the past. But when Roger and Brianna search for proof that Brianna's parents reunited in the 18th century, a shocking discovery makes both of them consider following in Claire's footsteps.